ILLINOIS (1876) The 409 ton whaling bark Illinois collided with the Marengo April 18, 1876 and went to the bottom in 15 minutes south of the Bering Strait. The Illinois was valued at $40,000 with her cargo of whale oil and bone. She had departed New Bedford January 9, 1872 bound for whaling in the Arctic. IRENE (1906) The 650 ton wooden barge Irene was taking on cargo alongside the steam ship San Mateo in heavy swells when her seams opened up and she foundered. The casualty took place in the outer harbor of Saint Michael at 11:30 a.m. August 5, 1906. The Standard Oil City towed the sunken barge into the inner harbor until she grounded. The damage to the barge, worth $8,000 was unknown. The 300 ton cargo of hay and general merchandise worth $37,000 was reported as 70% lost. It was unknown at the time of the wreck report whether the Irene had any insurance. ISLAM (1900) The tug Islam was one of the many vessels lost on the beach at Nome in the storm of September 14-15, 1900. 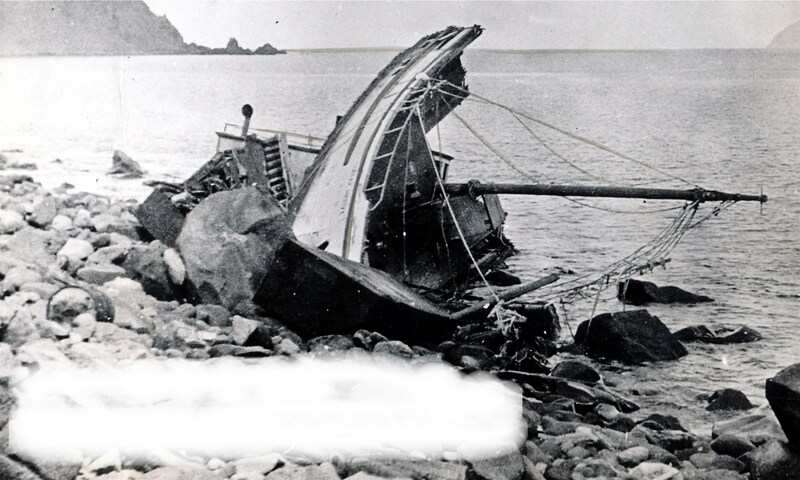 The tug Edith Thomas was lost with the Islam. ISLAM (1915) The 11 ton wooden steamer Islam was destroyed by a southeasterly storm while hauled out on the beach at Golovin Bay at 6 a.m. Monday October 6th, 1915. The Islam was on the beach at the mouth of the Niukluk River when the waves rolled her over and broke her up. There was no one aboard the vessel at the time. The Islam was valued at $3,000 and had no cargo or insurance.